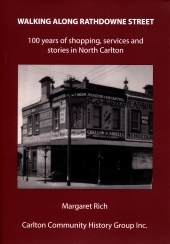 The Carlton Community History Group (CCHG) was established by a committed group of people interested in the history of Carlton, an inner suburb of Melbourne, Australia. CCHG was incorporated in 2007 and launched at the Carlton Library in 2008. We invite you to explore this website, find out more about us, read our newsletter, share your recollections and participate in our meetings and activities. Have you seen our latest publication? 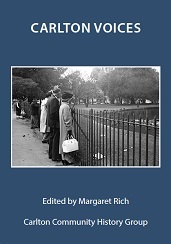 Carlton Voices is an edited and illustrated collection of stories which reflect the immense diversity of our local history. It consists of researched articles as well as reports of interviews with people from a wide range of ages and ethnic backgrounds. Each "voice" describes its own Carlton in colourful detail. A Chinese family whose patriarch arrived here in 1855 experienced decades of discrimination which continued into World War 2. A woman who lives next door to the house where she was born almost 95 years ago remembers tearing up newspaper to use in the lavatory in the days when toilet paper was a luxury. The heyday of Italian Carlton is recalled by the children of the charismatic founder of the Australian Festival of Italian song. Available for $15 (plus postage if applicable) from the Carlton Library and Alice's Bookshop in Rathdowne Street, North Carlton, and by mail order from CCHG. Visit the publications page for more information. The full schedule of meetings is available on the meetings page. More Information: Visit the Princes Hill Community Centre website or telephone 9387 7740. Walk through the historic and interesting streets of South Carlton to find remnants of the 1860s before the era of the cast-iron terraces, and learn something of Carlton's most notorious crimes, notable migrants, and more recent public controversies. Dr E. Rebecca Sanders, an historian who completed her PhD on the history of Churchill Island, will give an engaging and interesting talk on the History of Churchill Island and its prominent place in Victoria's Settlement. 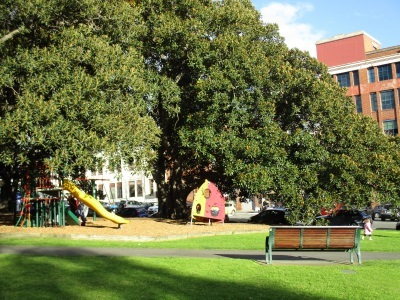 Hear RHSV tour guide Chris Manchee share some of the fascinating history, mystery and insights into the Flagstaff Gardens. Delivered in partnership with the Richmond & Burnley Historical Society. In 1852 a young woman from Westray, in the Orkney Islands of Scotland, made a life-changing decision to migrate to Australia. As Phoebe Papley lay on her bunk in the bowels of the plague ship Ticonderago, listening to the cries of children and the incoherent babbling of the dying, she must have wondered why she had taken this step that could end her young life. Many passengers died during the three month voyage and were buried at sea, along with their hopes and dreams. But the Orcadians – the people of the Orkney Islands – are known for their enduring spirit of survival. Phoebe survived and she went on to make a new life for herself and her family in Australia. Read Phoebe's story and find out about her connections with the "Monster" petition of 1891, and a neolithic figure discovered in 2009. Note: MMBW detail plans are available online at the State Library of Victoria's website. In the days before the advent of electricity, the streets of Carlton were illuminated with gas lighting. There were gas lamps on many street corners and several examples still remain, as truncated lamp post bases. The Melbourne and Metropolitan Board of Works (MMBW) detail plans, drawn up in the late 19th and early 20th century, include codes showing the location of gas lamps (G.L.) and electric light posts (E.L.P.). The two methods of illumination co-existed for a time, but electric lighting eventually took over and the gas lamps were decommissioned. 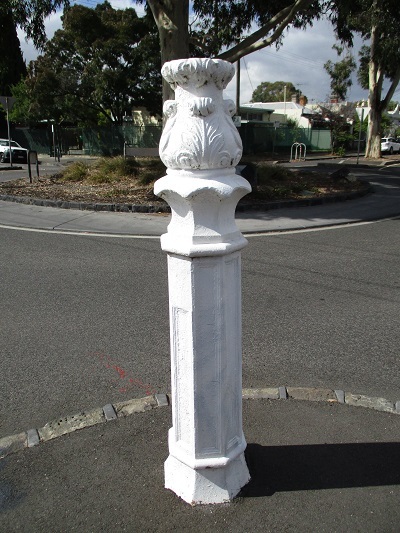 The upper portions of the lamp posts were removed, leaving the decorative bases. Corner of Lygon Street and Argyle Place, Carlton. The lamp post was made by "D. Niven and Co., Iron Founders, Collingwood"
The Age, 19 April 1906, p. 4. To find out how the tale of Romeo and Gwendoline ends, go to the Carlton in the News page. For more information on place and house names in Carlton, go to the Names page. The Melbourne General Cemetery has in the past been embroiled in controversy, scandals and criminal activity. Since its first burial in May 1853, the cemetery has seen interments of people from all walks of life, from prime ministers and prominent citizens through to paupers in common graves. 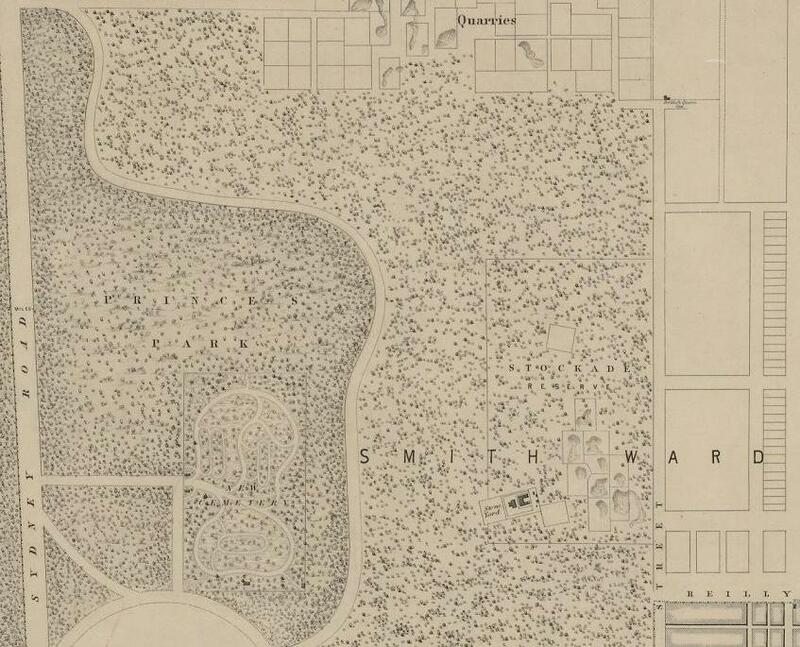 The cemetery was originally designed by Albert Purchas in the manner of a public park, with trees, shrubs and open space, and was the first of its kind in Victoria (possibly also in Australia). As originally envisaged, the cemetery was an attractive place for passive recreation and peaceful contemplation. But the management of the cemetery has not always been peaceful. In our latest newsletter, CCHG takes a look at the Melbourne General Cemetery and its interesting, sometimes scandalous, history. This newsletter was written by CCHG President Jeff Atkinson, who also conducts the very popular cemetery tours, organised jointly by the Princes Hill Community Centre and CCHG. Open this link to view the newsletter. The Feathered Arbour has closed in February 2019, with the expiry of the lease at its business premises. 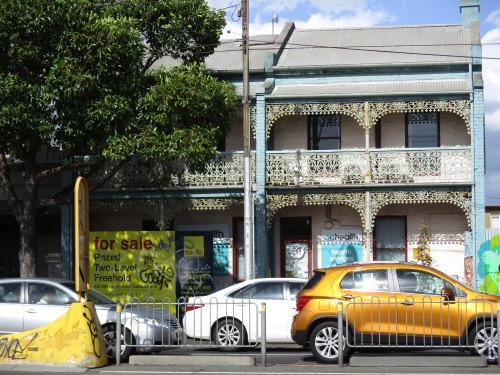 The building at 430 Rathdowne Street, North Carlton, home to the Feathered Arbour for the past six years, was once owned by motor mechanic Martin Shelley, who also operated his business at 420 and 520-522 Rathdowne Street. The Carlton Community Health Centre closed in November 2018, bringing to an end 39 years of community service. 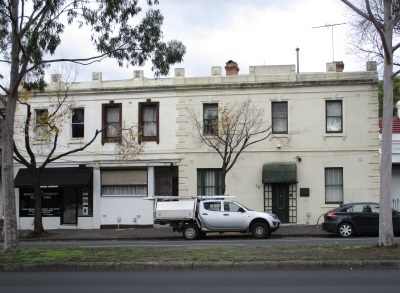 The centre first opened its doors on 1 October 1979 in a pair of terrace houses at 622 and 624 Lygon Street, North Carlton, near Princes Street. During the intervening years, the health centre has seen changes in the demography of its client base and the delivery of services, within the broader context of administrative, political and social changes. North Carlton was originally part of the City of Melbourne, but the reorganisation of municipal boundaries in the 1990s saw the service transferred to City of Yarra. The Carlton, Collingwood and Fitzroy Community Centres amalgamated as North Yarra Community Health (NYCH) in 1994. 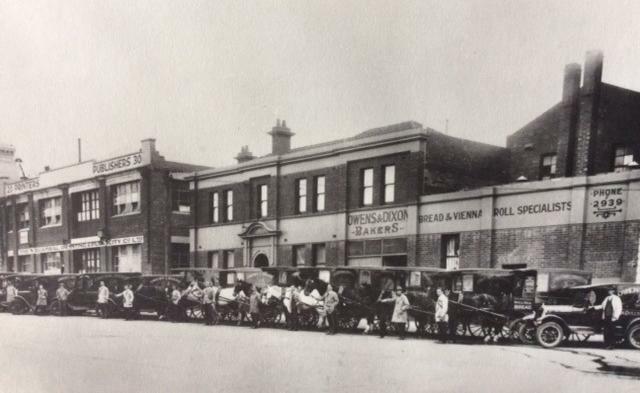 Bread delivery carts outside Owens &Dixon Bakery in Victoria Street, Carlton. Dale bread was baked on the premises in 1929. "All bread made for sale or sold or exposed for sale within Victoria shall be made of pure and sound flour or meal of wheat, barley, rye, oats, buckwheat, Indian corn, peas, beans, rice, or potatoes or any of them and with any common salt, pure water, eggs, milk, barm leaven, potato or other yeast and mixed in such proportions as may be thought fit, and with no other ingredient or matter whatsoever." LATEST NEWS in the BREAD Line. What causes the indigestibility of bread is the starchy matter therein. By using malt-or better Diastase of Malt-this starchy matter is changed into a substance which saves our stomach a lot of hard work by rendering it easily digestible for those suffering from an impaired digestion. The process adopted in the manufacture of this Malted Bread answers to perfection, as following analysts shows :"The analysis of Urban's Malted Bread is as follows :-Water, 29.70; fat, 0.70; carbohydrates and gluten, 68.08; ash, consisting of phosphate of lime, magnesia and salt 1.52-100.00. C. R. Blackett, Government Analyst." Keeping a week. Delivered daily. Critiques sent on application. 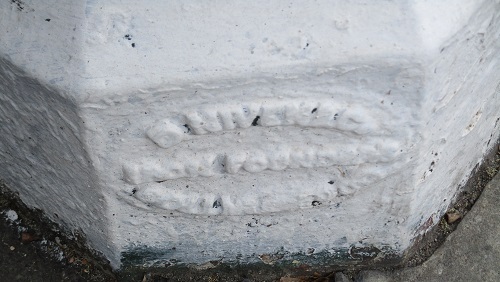 Sole manufacturer and patentee, C. Urban, 352 Drummond St., Carlton. At the time, the link between the protein gluten and coeliac disease was yet to be discovered, and the starch component of bread was thought to cause digestive problems. People on gluten free or lo-carb diets would be horrified to know that Urban's malted bread contained 68.08% carbohydrates and gluten. Highly nutritious, perfect in flavor, easily digested. New Era Bread is a fine source of energy and vitality. It is one of the best and most economical foods that money can buy. For more information on bakeries in Carlton, read our November 2018 newsletter. The atmosphere at the recent annual production by the Mangala Studios of Yoga and Creative Dance was reassuringly familiar. The theatre was packed with family supporters looking forward to another evening of quirky entertainment. Paper lanterns were laid out in the foyer for the usual just-after-dark walk through adjacent parkland. Peter Hockey was at the microphone, ready to narrate the storyline which would draw together the dances of a wide range of age groups. The youngest dancers were still at that age where they couldn't resist the temptation to rush to the edge of the stage and peer into the audience, looking for their parents so that they could wave to them. The oldest performers, some of them 19 or 20, took an altogether cooler approach, as one would expect of veterans of, in some cases, ten such productions. But the familiarity fell away when the performance finished and Peter announced that it had been the 37th - and the last. 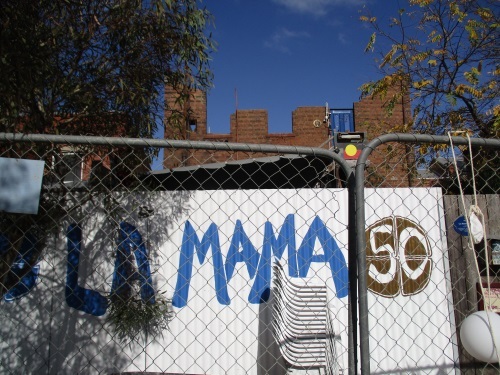 After almost 50 years at the corner of Grattan and Lygon Streets, Mangala is leaving Carlton and restructuring. Parking and traffic problems are part of the reason. Sadly, this move comes at the same time as the loss of another local institution, the Lygon Food Store, just a few minutes away. The success of this dance studio over so many years with students of all ages can be ascribed to its very relaxed approach. Yoga forms an integral part of the program for older students and the emphasis is on individual responses to music, not on the learning of rigid routines. No pointe shoes here! Everyone dances bare-footed. Today the studio is run by Peter and Sue Hockey and Claudia Mangiamele. Peter also offers tuition in Tai Chi. The women, now in their sixties, are daughters of Dorotea Mangiamele, who founded the school in 1970, and have been involved with it since they were teenagers. They have another important link to Carlton. Their father was Giorgio Mangiamele, a popular family photographer for Italian families in the 1960s and 1970s, but more importantly director of a number of ground-breaking films dealing with the experience of Italian migrants. The best known of these, Clay, was chosen to compete at the Cannes film festival in 1965. The Del Monaco name is one long associated with the family clothing business begun in 1938, on the corner of Faraday and Lygon Streets, Carlton. The family name features, for instance, in the book Carlton: A History (ed. P. Yule), where the family also played a role in the establishment of the iconic La Mama Theatre, set up in the building behind the Del Monaco shop. 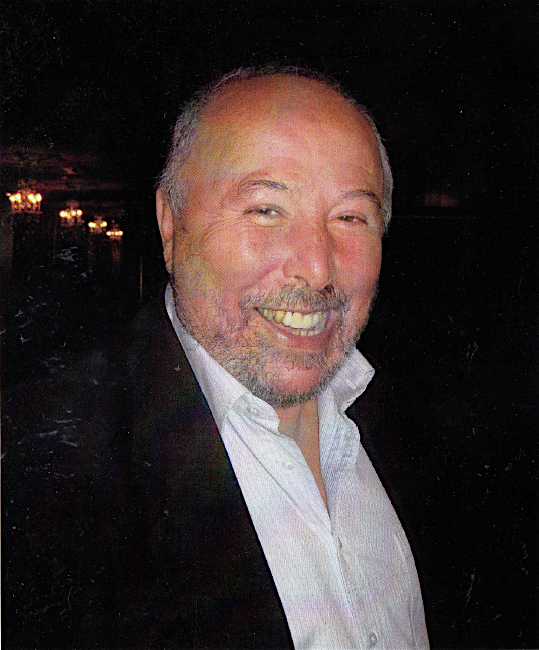 Frank worked for many years in the family business, and was heavily involved in local business and Italian community activities, remaining passionate about the history of Lygon Street, even after the end of the family business. He was a regular at CCHG meetings from its beginnings in 2006-07, until distance and poor health restricted him to occasional telephone contact with various members on topics that still engaged him. He was devoted to his family, with his four brothers, and five chidren surviving him, having lost one son earlier. Madge Connor was on her way home late one night in June 1918, taking the North Carlton tram, when she accidently dropped a bag of cakes she was carrying. A young man sitting nearby came to her assistance and picked up the bag. He seemed friendly, but the mood changed when he allegedly interfered with her clothing, pulling her skirt up to her knees. Madge slapped his face, then called for Constable Tucker, who happened to be on the same tram. If Henry Le Versha, 18 years old, was intent on an act of indecent assault, he had chosen the wrong target. Madge Connor was not only a policewoman, but also one of the first women to be appointed to the police force in Victoria. Carlton residents woke to the shocking news that La Mama Theatre in Faraday Street was gutted by fire in the early hours of Saturday 19 May 2018. 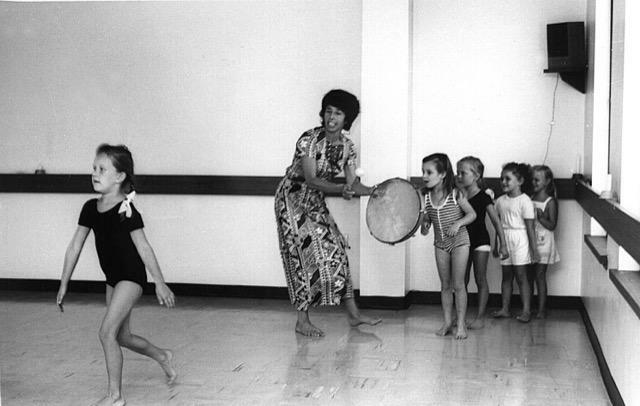 The innovative theatre was founded by Betty Burstall in 1967, in the style of La Mama in New York. The small two-storey building, once owned by the Del Monaco family, was a printing workshop, and an underwear and shirt factory before its transformation into an intimate theatre space. Betty Burstall, the "Mama" of La Mama, died in 2013. 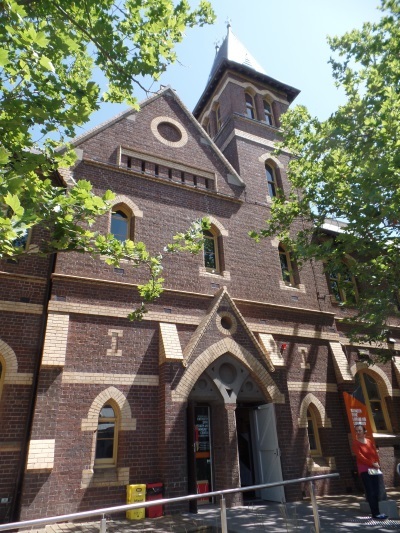 In the theatre tradition of "the show must go on", Saturday night's performance of Bully Virus went ahead at the alternative venue of the Kathleen Syme Library & Community Centre, on the corner of Faraday and Cardigan Streets. Bridget Kinsman (née Ballot), beauty therapist of Newry Street, North Carlton, lost her fight with cancer and died on 16 May 2018. She will be remembered as a gentle and caring soul, and will be sadly missed by her family, friends and clients. Bridget opened her salon Carlton Beauty Care in 1995, in a quaint two storey building on the corner of Newry and Henry Streets. Newry Street was not a prime location for a business, compared to the main shopping area of Rathdowne Street nearby, but it worked for Bridget. Word got around and her client base grew. She never had to advertise her services because the recommendation of a satisfied client was worth more than a thousand dollars of advertising. While other businesses came and went, Bridget's was one of the longest running to continuously occupy the building. Bridget Kinsman (13 August 1968 - 16 May 2018) was farewelled at St Peter's Eastern Hill on 24 May 2018. CCHG extends its condolences to her husband Jeff and their two sons. The shop at 119 Newry Street was built in 1881 by W. Hearndon. It has had a variety of uses over the years, including a fancy repository, tinsmith and bootmaker and repairer. A new seafood business, The Fishmonger's Son, has opened at the former Canals shop in Nicholson Street, North Carlton in May 2018. The two-storey building at 703 Nicholson Street was auctioned in October 2017, following the retirement of John and Peter Canals. The Canals family business began as a fish and chip shop, operated by Spanish migrants Joseph and Maria Canals, in Collingwood in 1917. 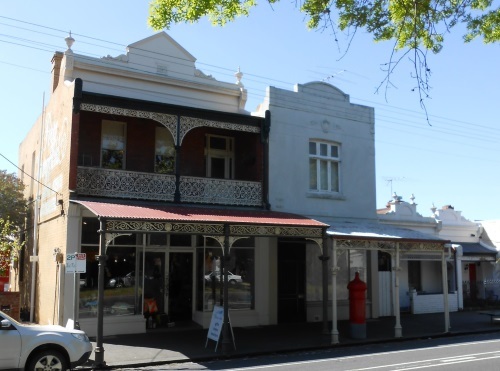 They moved to North Carlton in the early 1930s and took over an existing fishmonger's shop, which had been in Nicholson Street as early as 1905. Canals was a family business in the true sense, with successive generations learning the trade from their elders and making their own contribution to developing the business. Over the decades, migrants from Europe, like the Canals family, have done much to influence the Australian taste for fish and seafood. In 2017, the demand for quality seafood was greater than ever and the Canals brothers, John and Peter, chose to end on a high note and give themselves a well-earned break in retirement. Have you see the new mural facing the mini park in Shakespeare Street, North Carlton? The text "Little but Fierce" is taken from William Shakespeare's play A Midsummer Night's Dream and was suggested by a local resident. The full wording is: "And though she be but little, she is fierce". That Shakespeare Street is "little" there is no doubt. The street is narrow and runs for one block only, between Drummond and Lygon Streets. For the "fierce" side of Shakespeare Street, we need to look back in history. Shakespeare Street was the scene of at least two shooting incidents, one fatal, in 1922 and 1944. The street was identified as a "slum pocket" by the Housing Investigation and Slum Abolition Board in 1936-37. The people of Shakespeare Street had a battle on their hands in the 1950s and 1960s, when the Housing Commission of Victoria condemned five cottages on the south side (nos. 7 to 15 inclusive) as unfit for human habitation. The cottages were demolished in January 1970, leaving a vacant space ready for development. Without doubt, the fiercest battle fought in Shakespeare Street was in the 1970s, against the inappropriate building of a block of cluster flats on the south side of the street. Residents and other concerned citizens took action, at their own expense, by cleaning up the vacant site and creating a mini park for the benefit and enjoyment of the community. 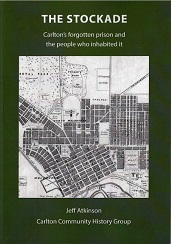 They bravely put their money where their mouth was, so to speak, and entered into an agreement with the City of Melbourne to buy the land. Decades later, the mini park and its new mural remain a tribute to the power of community action. 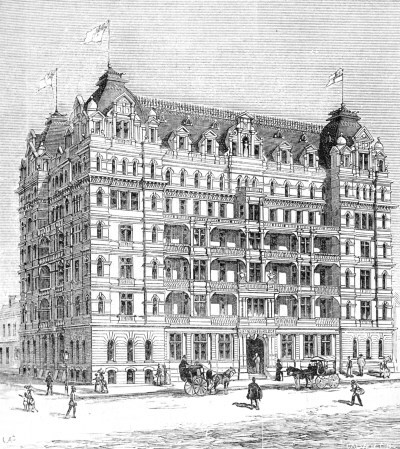 3 The United States Hotel was on the corner of Canning and Neill Streets, Carlton. It is now the Princes Hill Gallery. 4 The Pioneer Hotel was on the corner of Station and Neill Streets, Carlton. The building no longer exists. 11 The Argus, 15 August 1883, p. 11. For more stories of Carlton pubs, read our August 2017 newsletter. Architect A.A. Fritsch's drawing of St Joseph's Receiving Home extension, officially opened in February 1915. The original 1890 building facade was replicated in the new wing, and a chapel was added on the western boundary. The houses of the former Receiving Home are now numbered 103 and 105 Grattan Street, Carlton. Lincoln Square, in Swanston Street Carlton, has seen it all. This leafy green space close to the CBD, site of a Bali Memorial and reserved for public use since 1853, has survived attempted road incursions, locked gates, gang warfare, a gruesome murder and a recent take-over by skateboarders. Find out more about the history of this significant public space. For more information on the squares of Carlton - Argyle, Curtain, Lincoln, Macarthur, Murchison and University - read our August 2018 newsletter. For more information on sport and recreation in Carlton, read our newsletter on sport and recreation in Carlton. More information on John Curtain. The confectionery business that bore Nunquam's name continued for another three decades. The second cottage (no. 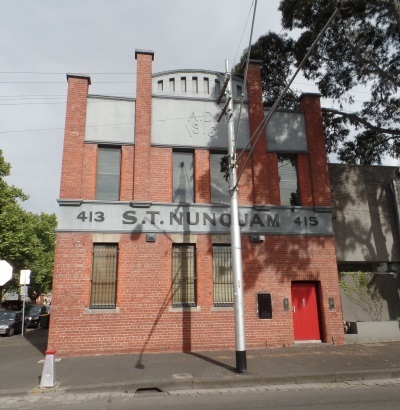 419) was acquired by Nunquam Pty Ltd in 1978 and the company owned all the land between Newry Street and the laneway to the north. With the downturn in manufacturing in the 1990s, conversion of inner city factory buildings to residential apartments proved to be a lucrative business. The land was sold in 1999 and a planning application for construction of six warehouse dwellings was lodged with City of Yarra in September 1999. The cottages were demolished in 2000 and replaced with modern structures, but the external appearance of the brick factory building remained largely unchanged. The old copper pots have ceased boiling and the fine dusting of powdered sugar that was often seen on the upstairs window ledge has long since gone. The tall chimney, built in 1920, remains as a visual memory of North Carlton's industrial history. More information on Stanislav Techitch Nunquam, the man whose surname means "never". It might seem strange to find a story about a travel diary written by a Russian in 1903 on a Carlton local history website. However, it sheds light on a small part of our history. The travel diary of 34 year old Aleksandr Leonidovich Yashchenko records the impressions of a Russian educationist and natural scientist who visited Australia for 3 months in 1903. He landed in Fremantle on the 2nd of July 1903 and sailed for Canada in October of that year. He visited places in Western Australia, South Australia, Victoria, New South Wales and Queensland and travelled by coach, train and tram, and ferry on the Murray River, as well as on foot. 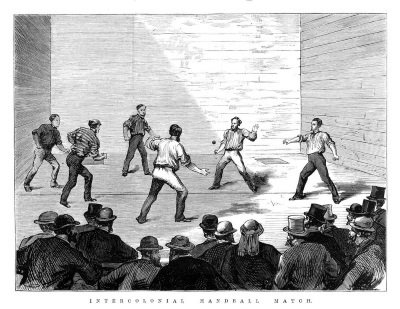 The main objects of his attention were the provision of education, the native flora and fauna, and the indigenous people with whom he spent some time observing football, spear and boomerang throwing and other aboriginal displays. He met local dignitaries, like Frank Tate, the Director of Education, John Smyth, the Principal of Melbourne Teachers' College, the Russian Consul, Mikhaylovich Ustinov, various Protectors of Aborigines, as well as numbers of people who were born, or had made their home in Australia, as well as local indigenous people and those whose job was to protect them. He was generally very well received. The whole diary is available in the Special Collections section of the Baillieu Library at Melbourne University and makes interesting reading. This short piece centres on part of Yashchenko's visit to Melbourne, time spent at what appears to be the Faraday Street School (SS 112) in Carlton, the home of the first practising school in 1880 and associated with every branch of teacher training until its closure in December 1972. At a time when the nation's biggest convenience store chain is being cast as 'rorting wages of its workers' it is worth noting that the history of one of the world's earliest trade union buildings is in Carlton, on the fringe of the central city, originally solely financed and built by the workers to serve as a place for the labour movement. This article centres on the role of the Trades Hall in Carlton and its connection with the fight for regulated working conditions, particularly the Eight Hour Day. 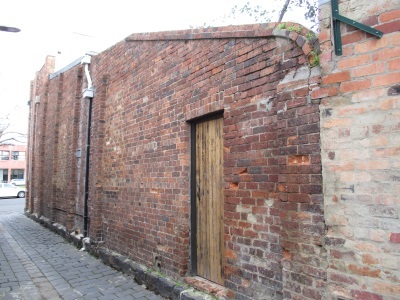 It was originally built in timber, after a successful union campaign in 1856, and was largely replaced by a two storey building with an imposing classical façade, bluestone foundations and brick walls with a cement render finish in the 1870s. Often we think of the World War 1 serviceman as young, single and eager for adventure. But many did not fit this stereotype. Read the story of John Lelean Cope, 48 years old, who left behind his wife and adult daughters in "The Manse" in Princes Street, North Carlton when he sailed for Gallipoli late in 1915. As we currently commemorate Australia's participation in wars, we need to see what role women played. Women are part of all societies, but when those societies are under stress the roles that women traditionally play can be either reinforced, questioned or even changed, temporarily or forever, and undoubtedly a state of war places a society under stress. So what happens in one town or suburb can be replicated in another. Both of the women cited as case studies in this article had some connection with Carlton and are therefore important to CCHG, but both also made significant contributions to many areas of Victoria. In August 2015 CCHG received a request for help in tracing the provenance of an 1827 French edition of the New Testament. An inscription on the inner cover suggests that it was acquired by Otto Jung in 1852. Inside the book, where presumably it has been for a century, is a used and opened envelope posted from Lorne and sent to Otto Jung at 1 Rathdown Street, Carlton. This was the address of the very grand Queen's Coffee Palace, begun in 1888 but because of the financial collapse never finished as intended. On the back of the envelope is a message in French, dated 1915. Not all of it is legible but the gist is very clear. Jung is making a gift of the book to "my beloved Paggie ... the only one in the Laver families (except her brother Lol) to have studied French" and recommends that she and her brother should read it from time to time. German-born Otto Jung arrived in Victoria in 1853 as a young man of 23 - presumably his French New Testament, acquired in the previous year, travelled with him. He settled in Castlemaine where he became a close friend of the Laver family, who were farmers at Chinaman's Creek. When Jonas Laver died in 1880 leaving a family of seven sons, Jung, now a wealthy man, took the younger boys under his wing. William Adolphus, the fourth son, was a talented violinist and when a visiting German musician heard him play as a teenager he offered him training in Europe. In 1883 William and his mother Mary Ann travelled to Frankfurt with her two youngest boys. It is thought that Otto Jung accompanied them. In 1885 or 1886 Mary Ann died, but with Jung's support the three young Lavers stayed on. One son, Rudolph, remained permanently in Germany but in 1893 Jung continued his support for this family by helping the youngest boy, Ralph, establish a successful preserving factory in Collingwood. William returned in 1889 in order to lobby for appointment to the Chair of Music, about to be set up at the University of Melbourne. He was not successful but became a private piano teacher and in 1895 oversaw the establishment of the Melbourne University Conservatorium of Music, initially located in the Queen's Coffee Palace. Otto Jung paid the rent for the first term. William married in 1894 and four children were born over the next five years. Lol (Laurence Otto) was the oldest and Paggie (Violet Agnes) the only daughter. Jung may already have been living at the Coffee Palace in 1895. Certainly it is his address on the electoral rolls from 1903 onwards. When he wrote his note to Paggie in 1915 she was 19 years old, Lol was 20 and their father's long-time supporter was 85. In the same year William Adolphus Laver achieved his ambition and became the third Ormond Professor of Music at the University of Melbourne. Otto Jung died in 1916. An interesting detail is that death notices in the Age and Argus recorded only his name, age and residence in the "Queen's Buildings". There is no reference to the Laver family to whom he had been so good a friend over so many years, or to anyone else. Have you seen our latest publications? Visit the publications page for more information.